DIY recumbents, choppers, trikes, quadcycles, velomobiles, tandems, trailers, electric bikes, scooters, and the great outdoors. We have thousands of photos in our Builders Gallery, videos, and a great community of bike hackers and builders in the Atomic Zombie forum. Join our helpful bike building community & add pics of your bikes. It's going to be a balmy +10 ºC (50 ºF) today! I know that sounds pretty chilly to some of you in warmer parts of the world, but to us that's awesome! Today marks the opening of the garage for some much needed spring cleaning and organizing. That's right - bike building officially begins next week. We've been learning about an incredible not-for-profit organization, Bicycles for Humanity (B4H), that refurbishes used bicycles and sends them to parts of Africa where they are desperately needed. 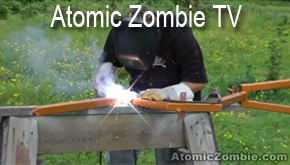 B4H is the feature story in the May issue of the Atomic Zombie Extreme Machines newsletter. They do some pretty incredible work in their communities to help the poor in many regions of Africa. You can read more here: http://www.atomiczombie.com/newsletter/may-2009.pdf . It got me to thinking about how much we Westerners waste and how easily we throw stuff away instead of fixing it and reusing. Today was garbage day in our neighborhood. We had our usual one bag of stuff, others along our street had four or more bags (the limit is four bags). That's alot of garbage for one household. Don't those people recycle? This topic gets me riled. I digress. Back to the newsletter, there's a funny piece submitted to the forum by one of our bike building gurus, Richie Rich. It will crack you up. And, there are some interesting stories on efforts in South Korea to expand that country's bike manufacturing and projects to promote the use of vehicles instead of gas guzzlers. Another piece details the electric bike phenomenon in the Netherlands and the European Union, and events by some Toronto artists who are also bike enthusiasts. If you have news, events, recipes or suggestions for the next issue, contact Kat through the forum: http://forum.atomiczombie.com . Will be back tomorrow with more news about the garage cleaning progress. 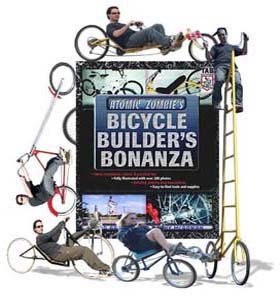 Added more choppers, trikes and recumbents to the Builders Gallery today: http://www.atomiczombie.com/gallery.htm . There are some really incredible bikes out there, and many talented home builders either building exactly from the plans, or making their own modifications to suit their individual needs and styles. Below is a trike similar to the LodeRunner Cargo Trike built by "Moon". Check out the gallery and see the hundreds of cool bike projects. Be sure to stop by the Builders Forum and find out what projects our dedicated AZ Krew is working on these days. The Freakbike Militia Golden Horseshoe Cruisers are holding their 4th Annual Hamilton Beach Cruise and Can-Am Challenge, July 17 and 18. The fun filled weekend includes pixie bike racing, social cruises, prizes and more. For information, contact fbmghc@hotmail.com . Atomic Zombie Extreme Machines will be sponsoring this event again this year. There will be AZ gear given away as prizes. If all goes well, garage cleaning will begin this weekend. So far, no more snow is in the forecast. The streets have been swept, so maybe I'll get my DeltaRunner on the road this weekend. That would be shaweeeet! We've been getting alot of questions about the Arcturus Camper Cycle project, so we're re-releasing a bit of the history of this project and how it got started. This is a work in progress. Updates will be posted here in the blog and on the forum: http://forum.atomiczombie.com . Since the day I began dreaming up bicycle creations, I have always wanted to create a large human powered camper with an electric assist running on batteries that are self charged using solar power. This vehicle would have to be large enough to sleep at least two people and have enough room inside to stand up and move around. Of course, the entire unit would have to be made extremely light for its size and incorporate space age design and materials in order to remain partly human powered. With the new power assisted bicycle law, I could now add a 500 watt motor to the camper as well, so this would make hill climbing a lot easier, and allow for a larger battery bank that would run the motor for at least 50 KM and then power all of the onboard electronics and appliances when parked. The vehicle also had to have no more than three wheels, or it would not legally be classified as a bicycle in my area, so the trike design was the only option and would allow for a more streamlined body. The inside of the camper area will be 4 feet wide, 10 feet long, and 6 feet tall. The cockpit area of the camper will have a bout the same size as the Kyoto Cruiser shown above, with plenty of room for two riders to sit comfortably without rubbing arms or shoulders. Of course, there will be a main seating area that also pulls out for an additional 2 person bed, a large table, storage area, small sink, stove, heater, and built in LCD screen, all running off the battery bank. The battery will self charge using a large solar array mounted on the roof of the camper and via plug-in during cloudy days or between long hilly journeys. This may sound like a lot of equipment, but I plan on a total weight of no more than 400 pounds. 400 pounds is 200 pounds of cycle per person, and if you include the power of the electric assist motor, pedaling the vehicle will be as easy as riding any bicycle. Regenerative braking will also be incorporated into the custom computer controlled charging system, motor controller and "smart" assist system, which will instinctively know how much power to split between human and motor for seamless hill climbing and acceleration. Initially, I tried to convert the Kyoto Cruiser (shown above) tandem trike into the base vehicle for this camper since it already had three wheels, sociable seating and a rugged frame. The resulting frame modifications are shown below before any trussing was added to the frame to make it stiffer. Although the Kyoto modifications were very successful, I decided not to continue this version and opted for a fully redesigned trike with all wheel suspension, two wheels in front and a larger wall tube frame. A trike with two front wheels will allow a more aerodynamic body to be made so top cruising speed and distance can be increased. Contrary to popular beliefs, a fish shape is much more aerodynamic than a wedge shape with the pointed end facing forward. This new design will also yield a larger cockpit windshield for driving safety, and will allow the motor and battery bank to be placed at the rear of the vehicle for better drive wheel traction. I have also decided to increase the main frame tubing to 2 inch square with a 1/16 inch wall to make a very light yet stiff frame. With the new stiffer frame and full suspension, larger batteries and a 2000 watt assist motor can be used, but bicycle wheels would become the weak link under that type of loading. For this reason, the wheels used will be light duty trailer wheels, which weigh only twice that of 24 spoke BMX wheels yet offer a safe load carrying capacity of almost 6 times as much. I will be using bicycle disc brakes on the two front wheels and a motorcycle disc at the rear wheel, which will also be the drive wheel. Each rider will have an independently shifted 15 speed transmission which will combine through a jackshaft to the rear wheel. This CAD render shows the overall size of the camper and frame and will be used as a guide to build the basic frame. Doors, windows, heating and interior will be designed around the frame, so the above render is just a crude example of basic shape. The goal is to create a rolling frame that can be motivated under human power before working on any electrical system or the body so all the bugs can be worked out easily. From this point on, my only rigid plan relates to the size of the basic frame as shown in the photo below. Here are the 8 tubes that create the perimeter of the basic frame. These tubes are 2 inch square with a 1/16 inch wall, so they are very light and quite stiff. There is almost no flex in the 10 foot long tube if I stand in the center while each end is supported by the buckets, but I will still be adding trusses to carry the increased load of the body and electrical system. On an unfaired mono boom vehicle like the original Kyoto Cruiser, a little frame flex is not only considered, but it is a practical suspension system for light road shock. On a faired vehicle though, the frame must also support the body work, which could crack or become damaged if the frame were to flex, which is why I will be adding trusses to increase the frame stiffness many times over. The camper body will actually be made as a separate entity and then placed on top the frame much like the way many RV's are constructed so it will not rely solely on the frame for integrity. Using my 3D render as a guide, I cut the tubing for the main frame and tacked it all together. All tubing is mild steel square tubing with a 1/16 inch wall. The main boom is made from 2 inch tubing, the bottom trusses are 1 inch, and the tubes that form the triangles in the trusses are 3/4 inch. Even tack welded, the frame is extremely stiff and there is no detectable flex with two adults standing in the middle with each end supported as shown in the above photo. The other surprise was the weight of the frame at this point - much lighter than I thought it would be. Once the main frame is complete, it will go on the scale for a weight check. The frame is just over 15 feet long right now, but once the body and rear swing arm is in place the vehicle should end up just over 18 feet in total length, which is perfect. The two front wheels are positioned at the passengers seating area, so the wheelbase will be just over 10 feet and will allow a turning circle much better than many compact cars, although I doubt Arcturus will see to many tight spots such as a bike path. Shown above is the generator drive system from an old prototype single passenger sleeper trike called The Nomad. Although the gear reduced DC motor was only 75% efficient, it did provide many options for a chainless hybrid drive system, allowing the generator to input drive power, charge batteries, and made it easy to seamlessly integrate human and electric power to a single rear drive motor. I have decided to give Arcturus a similar drive system, but this time I will be building from scratch my own custom low RPM high efficiency axial flux generator using NIB magnets. This generator will be in the 90+ efficiency zone, and not require any lossy gear reduction, so the entire hybrid drive system including controller electronics should be very efficient and smooth. This system also eliminates much excess chain and a few of the bicycle freehubs that would be needed. Each rider will still have their own 15 speed transmission into a shared axial flux generator shaft though, so effort can be tailored to personal preference for cadence and torque. The rear suspension swing arm will be the next step. The rear swingarm tubing will be made from 1/8 inch wall 1.5 inch square tubing. This tubing is the perfect width to mount the rear wheel pillow block bearings to and has twice the wall thickness of the main frame tubing due to the fact that it will also carry the main drive motor. The two bearing tubes each contain a pair of 3/4 ID sealed bearings so that the suspension movement will be very smooth and friction free. The bearing tubes will be welded to the end of the swingarm tubes and held to the main frame by a bolt on each side. The basic swingarm is now completed, ready to have the holes drilled for the two 3/4 pillow block bearings that will carry the rear wheel, main drive sprocket and motorcycle disc brake. The swingarm will also carry the main drive motor so that its mass will be placed over the swingarm mounting bearings to keep shock to the motor down to a minimum. A single gas filled mono shock design will most likely be used for the rear suspension, much like a motocross bike, which will allow good adjustability and a lot of travel. The next step will be the installation of the rear wheel bearings, drive axel and swingarm mounting brackets. The pillow block bearings will carry the 3/4 rear drive shaft, rear wheel, drive sprocket and disc brake. End caps have also been added to the ends of the swingarm tubing to keep out moisture and prevent the walls from collapsing as the bearing bolts are tightened. The pillow block bearings will be on the underside of the swingarm so the bearing is pressed up against the swingarm tubing, keeping most of the stress off the cast iron bearing body. Using my favorite tool, the angle grinder, I cut these swingarm brackets from some 1/4 inch angle iron. They will carry the two rear swingarm bearings after being fastened to the rear of the frame. Each of the two swingarm bearings will be held between a pair of mounting brackets by a 3/4 inch bolt and locknut. These heavy duty swingarm mounting brackets will take the stress away from the rear of the frame and spread it out into the walls of the tubing. Stay tuned, this is my "Spare Time" project! Yes, I think it's safe to say that spring has finally arrived. Although we got almost 3 feet of snow dumped on us last week, it's melting quickly and the days are growing longer. You know what that means - the garage will be opening soon! Thank goodness, although we're not out of the woods yet. Anything can happen over the next two months. Let's hope that we can actually get a head start on this year's bike building season. I've been collecting interesting news articles from around the world to share with everyone. These are just a couple of items that I found recently. People who are socially engaged and can easily brush off stress may be at a reduced risk for Alzheimer’s, a new study reports. The study adds to a growing body of research linking lifestyle and personality traits to a lower chance of developing dementia in old age. The research, from doctors at the Karolinska Institute in Sweden, found that older men and women who were easygoing and had active social lives were less likely to develop Alzheimer’s disease than those who were shy and anxious. Earlier studies have linked long-term stress to poor memory, possibly because stress hormones can negatively affect the brain. "In the past, studies have shown that chronic stress can affect parts of the brain, such as the hippocampus, possibly leading to dementia," said study author Hui-Xin Wang, Ph.D.
"But our findings suggest that having a calm and outgoing personality in combination with a socially active lifestyle may decrease the risk of developing dementia even further." The findings appeared in Neurology, the medical journal of the American Academy of Neurology. The study involved 506 seniors whose average age was 83. None had Alzheimer's when first examined. After six years, 144 of the study participants had developed Alzheimer's or another form of dementia. Those who were socially active but who tended to remain calm and relaxed under pressure were 50 percent less likely to develop dementia than individuals who were isolated and easily stressed. Protection against Alzheimer's was particularly strong among those who were socially outgoing and able to handle stress well. Extroverts who were calm and self-satisfied tended to have an optimistic outlook on life, the study found, and also had a 50 percent lower risk of developing Alzheimer's than outgoing people who were nervous and prone to worry. "The good news is, lifestyle factors can be modified, as opposed to genetic factors, which cannot be controlled," Dr. Wang said. "But these are early results, so how exactly mental attitude influences risk for dementia is not clear." Dominic Hargreaves, 23, a design student at the Royal College of Art has had three bikes stolen since he moved to the capital. And Dominic’s not alone: on average 52 bikes are stolen in London every day. Looking at this modern urban problem as a design challenge, the young student realised that the only way to overcome the problem was to lock the bike somewhere out of the reach of thieves. His solution? A bike lock located 8 feet above the ground. How does it work? The bike cradle can be fitted to any wall and is attached to an electronic hoist which lowers to the ground when triggered by the owner’s remote control. The mechanism can also be programmed to read an oyster card if located at a tube station, or indeed any public location. Once the bike is placed into the cradle and locked in position, the user then activates the hoist to pull the bike up onto the wall. The bike is then safely out of the reach of thieves and their bolt cutters. Dominic believes the idea would work on domestic dwellings such as houses or blocks of flats as well as public spaces like railway or tube stations. We changed the format to PDF so it's easier to view and save to your computer. We are inviting all Atomic Zombie krew members to submit story ideas and contribute to the monthly newsletter. If you have something you'd like to contribute, please contact KoolKat through the Forum. Finally after five years of planning and three trial attempts at a frame, The Arcturus Camper Cycle is ready to be built. The new version will be a three wheeled vehicle with two wheels up front and one in the back so that it can take on a teardrop shape with maximum aerodynamics. Being a trike also makes it legal as an electric assisted bicycle so there will be no problem driving it on the street. Make no mistake, this is a full sized motor home, not a coffin on wheels, so it will sleep two or more people comfortably and have the same size interior and amenities that any small motor home would have. Before I dig into the technical details, have a look at this huge pile of notebooks from the past few years that have included many of the design incantations of Arcturus. Original concepts had a side-by-side tandem tadpole trike pulling a large trailer unit, and I went as far as building the actual trike before realizing that the weight of the trailer would require a more robust and electric assisted trike to pull it. The truck and trailer idea was scrapped is it just did not seem as cool as an all in one motor home style unit that you could just pedal onto a campground and park. Another version was tried by extending the frame of our KyotoCruiser sociable delta trike by 10 feet in order to build a camper area in the back. Although the base vehicle did work very well, it became clear that suspension was needed on all wheels and something more robust than bicycle wheels would be needed in order to carry the entire weight plus deliver the powerful electric assist to the road. Another version of the delta frame was built using 2 inch square tubing and was designed to use 16 inch trailer wheels and brakes. Again, the design become complex because of steering and transmission issues between the human input and electric power, so a completely new design was needed. Bored one night, I dug through five years of notes to realize that a very early concept was probably the best all around - one that used a Jeep front differential of all things. You might think a Jeep differential would be overkill for a human/electric hybrid vehicle, but the design is actually perfect. A "Dana-30" differential only weighs about 150 pounds and includes a front wheel drive system with included Ackerman and center point steering, disc brakes on both sides, and a perfect gear reduction system to connect directly to the PMG-132 electric motor I plan to use. By adapting the battery pack directly to the differential, it also carries 75% of the vehicle weight on wheels that were designed for the task, so in reality, the rest of the camper can be made of lightweight high tech composites. The Jeep differential, motor, controller, and all batteries will be a single "power unit" ready to drive, brake, and steer the entire vehicle. As for human input, I plan to have each rider pedal a single home built axial flux generator so that power will be fed directly into the drive bank with very little loss. When parked, the human powered generator can be used to "top up" the battery banks for all night LED lighting when power is scarce. Roof mounted solar cells will also aid in charging the banks when the camper is parked. With the PMG-132 motor running from one of two onboard 48 volt packs, the range of the vehicle will be about 100 kilometers at speeds legal for an electric assist bicycle. Having two battery banks makes more sense as the efficiency of the motor is almost 95% at 48 volts, and a large shunt switch can swap banks to keep them from running too low. Since all of the transmission and drive system is all self contained at the front with the differential, a simple motorcycle swing arm and suspension will be used at the rear of the vehicle. That's all for now. As soon as the snow melts and I can source a Jeep Dana-30 differential, I will begin working on Arcturus and documenting every single step. I think a full sized human/electric motor home with a range of 100 kilometers is just what the world needs as gas prices skyrocket out of control and waist lines bulge! I also look forward to hearing from the many talented garage hackers out there as this project progresses, so please drop in and say hello! still not in full bike building season yet. April is very unpredictable, so some spring cleaning will be done first before diving into this year's line up of bike and e-bike projects. Very soon, though. We are completing work on a book this week, and will be able to devote more time to the garage and building more bike projects this year. Hopefully, the weather will co-operate and this year will be the best ever Atomic Zombie building season. A sure sign of spring are the tulips waking up from their winter slumber (right). Although I love summer, spring is my second favorite time of year, when everything starts over again. Really looking forward to planting the vegetable garden again and enjoying some fresh produce right from the backyard. I miss that the most over the winter. We are very excited about starting work on the Arcturus Hybrid Camper Cycle project this year, too. It will be an ongoing build that we will blog about regularly and post pictures so that you can follow along, maybe even build your own, too. We are fielding alot of questions about that project, but honestly have nothing new right now to report on it. We are sourcing some needed parts and hope to start making some progress on it very soon. So, stay tuned here and to the forum for updates and news. A hearty congratulations to the Greenbird Team for setting a new World Speed Record. On March 26 at Ivanpah Dry Lake, California, British engineer Richard Jenkins set a new record for wind powered vehicles. The team's Ecotricity Greenbird clocked 126.1 mph, smashing the former record of 116 mph by Bob Schumacher in 1999. The Greenbird is officially the fastest wind powered vehicle on Earth. For more information, visit http://www.greenbird.co.uk . Also, two Atomic Zombie thumbs up to Cycle-re-Cycle, in Bradford, UK, for customizing a tandem bicycle to teach the blind how to ride a bicycle. Way to go Tony, Chris and the entire gang! For more information, visit www.cycle-re-cycle.org.uk . That's it for now. Will chat again soon. Cheers, friends. All content is copyright (c) Atomic Zombie Extreme Machines. All rights reserved. Watermark theme. Powered by Blogger.